Detail of my adventure with the only cure for Multiple Sclerosis. Hematopoietic Stem Cell Transplantation (HSCT). 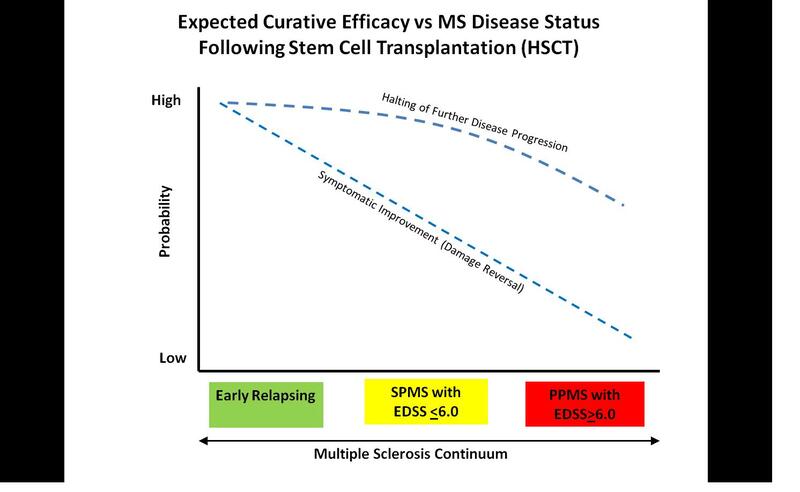 There is currently only one scientifically-demonstrated & confirmed treatment for Multiple Sclerosis with enduring curative efficacy: Hematopoietic Stem Cell Transplantation (HSCT). This is not a new medical procedure; it has been performed millions of times all around the world since the 1960's for treatment of cancer (now approximately 50,000 times per year) and has been used successfully to cure several types of hematologically-rooted autoimmune disorders since the early 1990's (such as MS, scleroderma, rheumatoid arthritis, lupus, CIDP and others). It involves chemotherapy so the treatment is both uncomfortable and expensive (most medical insurance will not yet cover it for treatment of an autoimmune disorder until the phase III clinical trial is completed later this decade, or the beginning of the next). It is not an impossible procedure to endure, as many people do it (including me) and make it through just fine. But this procedure is currently the ONLY treatment that has been scientifically verified to stop the underlying MS disease process, restore normal immune self-tolerance and produce lasting curative symptomatic improvement for the majority of MS patients, as it has for me and others. And definitely worth mentioning. . . . probably one of the biggest intangible benefits to stopping the MS disease progression is that this treatment restores a degree of certainty to the future of a person's life that MS often robs us of. To me this has been worth more than gold. Beyond this the only outstanding question of relevance here. . . . How much is a cure for MS worth to you in terms of time, inconvenience and money? Something that can only be answered by each individual. The reason you probably have not previously heard of this treatment and it's curative effect on MS is because it is still a rather uncommon procedure for treatment of autoimmune disorders. But that is changing. 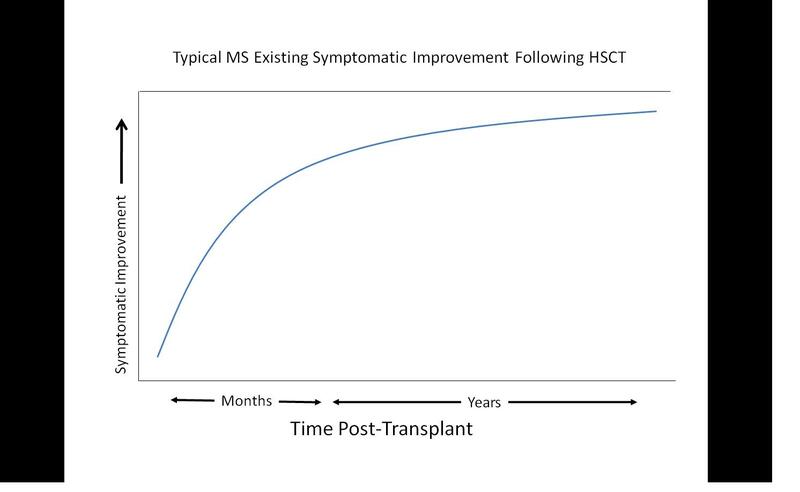 As of 2008 there were a cumulative total of 400 people worldwide that had undergone HSCT for the treatment of MS. Admittedly that's not a huge number. But by 2010 that number had jumped an additional 20% to 500 people treated worldwide for MS, and a total of about 1000 for all autoimmune diseases combined with the number continuously climbing. 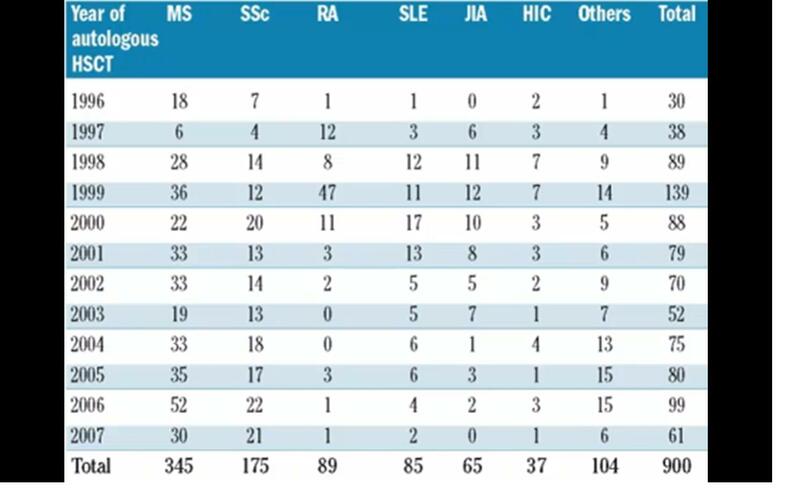 (As of 2012 the numbers are closer to 1000 treated for MS, and closer to 2000 for all autoimmune diseases combined.) So it is just now starting to gain more traction and acceptance by the broader medical community for the treatment of MS. I'm probably the first person from North America to have the procedure completed outside of a clinical trial or study to cure my MS. But just wait until the phase III clinical trials are complete later this decade, or early the next. Then the numbers will quickly jump into the many thousands. I guarantee it! It is still not understood "why" MS occurs. But it is well understood "what" is happening in individuals with MS.
"This work is significant because for the first time we are able to definitively establish a cause-and-effect relationship linking the marked T cells to the development of relapses and show unambiguously that it was the same T cells that mediated relapsing cycles""Targeting such disease-causing T-cells in MS is definitely a valid therapeutic approach that should be pursued," Tse added. As a curative treatment HSCT works by partially or completely erasing the body's immune system memory. This effects a beneficial change of the body's overall B- and T-lymphocyte epitope (antigen binding) repertoire, inactivating autoimmunity (making the body's immune cells "antigen naive") which results in restoration of immune self tolerance. This is often referred to as "resetting" the immune system which stops the underlying MS disease activity & progression. Once achieved, the body then has a chance to repair (or compensate for) existing neural damage that is not undermined by further MS disease progression, often resulting in substantial and lasting symptomatic improvement. The interesting fact here is that it is the chemotherapy which is effecting the curative aspect of the treatment by wiping out long-lived T- and B-lymphocytes of the body that carry the faulty autoreactive memory so they may be replaced by naive, unprogrammed and self-tolerant non-autoreactive lymphocytes generated by the bone marrow. The stem cells themselves are not the specific reason for the curative effect of this treatment. The re-infusion of the hematopoietic stem cell graft is simply for the purpose of re-establishing the bone marrow which has been ablated as part of the chemotherapy conditioning. So in effect, the stem cells are not curing the patient of MS, but are instead "rescuing" the patient from possible mortality as a result of the curative chemo conditioning regimen. This is why the stem cell graft is sometimes referred to as "stem cell rescue." It's just rescuing the patient from near certain death (for myeloablative protocols) due the treatment and adding an extra measure of a safety factor for non-myeloabltive protocols. The takeaway concept here is no chemotherapy = no cure. This is why simply injecting stem cells into the body does not render the body's immune system self-tolerant as is required to stop the underlying MS disease activity. Sorry. No free lunch here. Then in the 19990’s Dr. Richard Burt (formerly with the US NIH and currently a researcher at Northwestern University Feinberg school of medicine, Chicago) whom became interested in the work began the first US-based HSCT clinical trial work with myeloablative hematopoietic stem cell transplantation (HSCT) for MS. He later (collaborating with Prof. Shimon Slavin) worked to find a way to maintain the efficacy and to reduce the (then) mortality of the treatment by switching to a strongly-lymphotoxic (and milder myelotoxic) chemotherapy protocol with either (Fludarabine + Cyclophosphamide or Campath-1h) or an alternate therapy of a combination of (Cyclophosphamide + Anti-Thymocyte Globulin (rATG)) which does not kill off 100% of the bone marrow; reducing the period of time the patient must survive with degraded (not ablated) immune function and a corresponding risk reduction of possible infectious treatment complications. This work continues today with the completion & evaluation of a NIH/FDA phase II Clinical Trial and an ongoing randomized phase III trial with very good consistent curative results. Dr. Burt’s approach is lymphoablation with autologous HSCT transplantation. Dr. Nash’s approach is myeloablation with autologous HSCT transplantation (the protocol I received). The University of Louisville is currently doing a phase I/II study of myeloablation with allogeneic HSCT transplantation with mixed chimerism (i.e. mixing & infusing of differing amounts of both donor and recipient stem cells together for grafting). All three phase II studies in the US to date have already completed all patient transplantations and no one has died as a result of the procedure. Now that the treatments are complete the lengthy & involved follow-up work is being done now to evaluate the patient outcomes. This will of course take several more years until final reports are published. All these programs have already designed the phase III studies and have submitted the program plans to the FDA for approval. Currently Dr. Burt's MIST program in Chicago is in active randomized phase III patient selection & treatment with others coming online soon. The Lancet publisher contacted me to ask if I would include a link to their website publications portal regarding MS (and neurological issues in general). The Lancet maintains sound scientific standards and ethically responsible publications and I am happy to list thier website publications portal link for your perusal (and they also list technical articles for hemotopoietic stem cell transplantation for MS relevant to my own blog). Also as explained by the publisher, "Your visitors will be able to listen to free podcasts for author interviews and expert discussions covering international issues relevant to (MS) neurology. Here, individuals can learn more through our direct links to free resources such as reviews, opinions, and news throughout the Lancet online community.". . . . I'm trying to have a stem cell transplant done either in Seattle or Chicago via one of the studies. The issue is insurance and funding. I know it's the only cure, and I'm terrified of what will happen if I don't. My congratulation and respect for you deciding to take control of your MS, instead of the other way around. I completely understand your concern. . . . unfortunately both trials in the US are very expensive (last I heard well over $200K for Seattle's HALT and close to $150K for Chicago's MIST). It's especially concerning since the majority of participants must pay on their own. However, overseas treatments may be a less-costly alternative, if it were to come to to that. Likely less than half the price. Stay strong! Once completing the transplantation procedure you can likely look forward to a life of progression-free MS. And improvement on top of that! I hope you will have the opportunity to keep me updated. George: thank you for hosting this site. My 21 year old son was recently diagnosed after experiencing optic neuritis & MRI confirmation. Do you know if the University of Basel, Switzerland's program is as effective as Dr.Burt's? Do you know the cost? We are determined that our son receive treatment sooner rather than later. First of all thank you for taking the time to put down your experience with hsct. I have been searching for details on stem cells, and your info was very detailed. Diagnosed with progressive ms with relapes at Mayo last month. Initial diagnosis was RRMS from a local nuerologist. I have made the decision to move forward with the hsct asap. Any info you can give to speed this process would be greatly appreciated. I am located in Wisconsin and willing to travel anywhere. I have been told to go to a "clean" country. If you are in US & disabled you should qualify for SSDI & Medicare. Medicare covers Dr. Burt's HSCT. My husband Marc Coppins got his transplant in May 2011, so almost a year ago. See http://www.MarcStemCell.com for more info. I've been having a difficult time finding available hospital facilies around the world that will perform this HSCT procedure (since it is a complex and sophisticated procedure that must be done properly to be safe). I have not checked everywhere in the world so there must be places that I am unaware of. However, I am aware of the place that I went (Heidelberg University Hospital) that will perform myeloablative HSCT for multiple sclerosis. Also, although I have no first hand experience with this facility, I understand that CTCI in Tel Aviv, Israel [http://ctcicenter.com/index.php] will perform the non-myeloablative protocol for multiple sclerosis. (So far both protocols have shown substantially similar very good curative results at several years out.) If I had my drothers (and also because a "clean" facility is high on your priority list), I personally would aim for Heidelberg's treatment since I personally think it has a better chance of lifetime cure success. Do you know what the outcomes are on the anyone who has used the Heidelberg Hospital for the HSCT for ms? Positive and negative? The only person that I have first-hand knowledge that went to Heidelberg to have HSCT treatment for MS is myself. The outcome is that my MS disease activity completely stopped and my pre-existing MS symptoms have improved 40%. It's been a little over 6 months since your last entry and I am wondering how your tracking? I , like Carmel Turner am from Melbourne Australia and have MS . I am now considering stem cell therapy . This is against the advice of my neurologist and my own brother , who is also a neurologist , both of whom adhere to that oft stated " it's still experimental" line. I have had RRMS over past 20 years but am now experiencing a rapid decline in mobility. I need to do something now as later will be too late. Are you still experiencing the same benefits of the treatment ? Do you still consider it worthwhile? I am eager to hear your experience.. Ps I am an allied health professional . It is definitely worth while. Do lots of research cuz there are scams out there. If you are in US & disabled you should qualify for SSDI & Medicare. Medicare covers Dr. Burt's HSCT. My husband Marc Coppins got his transplant in May 2011, so almost a year ago. See http://www.MarcStemCell.com for more info.Good luck to you! Congratulations on your success. My wife has been diagnosed for over a year now and since diagnoses has had two relapses. She has now moved to Tysabri as a treatment which she seems to be tolerating well and has shown good signs of improvement. This is best course of action for now, but in the longer term we are looking for solutions. HSCT is exciting but at the same time very intimidating. Thank you for such an informative blog your imformation is of great help to us who are looking for answers and dont have a decade to wait. Hello, George - I have some questions regarding any side effects of the chemo that was done to "wash" the stem cells before being reintroduced into your body. I was in a cladribine trial about 2 years ago, and still believe, despite the "wash out" period I was told about, that it has caused my health to deteriorate pretty rapidly in the past 18 months. If I were to get into an HSCT trial, what could I expect as chemo side effects and would they cause other physical problems? Very nice post. I just stumbled upon your weblog and wished to say that I've truly enjoyed surfing around your blog posts. In any case I will be subscribing to your feed and I hope you write again very soon. Sincerely thanks very much for your kind comments, Analisa. I plan to make some posts about relevant topics on a more frequent basis. I am one of the Admins of a Facebook Stiff Person Syndrome (333.91) group and would like to correct the omission of our autoimmune disease from your list above. We currently have our third patient in recovery at Ottawa, one in treatment at Seattle, and another accepted and wrangling insurance for University of Michigan. One or two are in discussions with Denver. "SPS" is when the autoimmune GAD65ab that usually attacks the pancreas and causes diabetes, instead attacks neurons. Symptoms include the finest blend of MS, Parkinson's and tetanus; with the side effects of current drug treatments - heavy benzos, such as Valium, pain medications, IVIg, Plasmapheresis, or rituxibub. 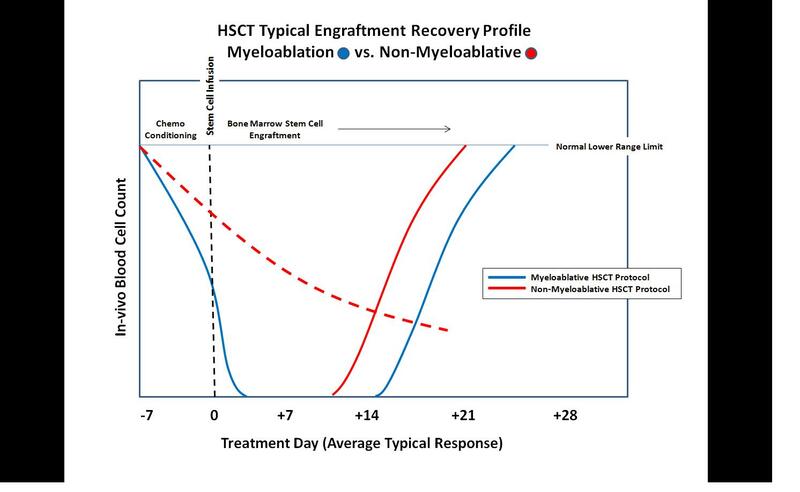 The disease is progressive but our early HSCT patients have reported near total recoveries. Thanks very much, Joseph. You are absolutely correct! I have added SPS to the list of autoimmune disorders that can and does benefit from HSCT. There are so many more hematologically-rooted autoimmune disorders that can benefit from HSCT that I am far short of listing them all. 6 month report - I'm cured!